MIAMI GARDENS, Fla. — Two hours before Sunday afternoon’s pivotal matchup with playoff implications the Dolphins inducted four former players to the team’s Walk of Fame at Joe Robbie Alumni Plaza. Linebacker/defensive end Kim Bokamper, wide receiver O.J. McDuffie, running back Mercury Morris and guard Keith Sims were part of the third class of inductees. 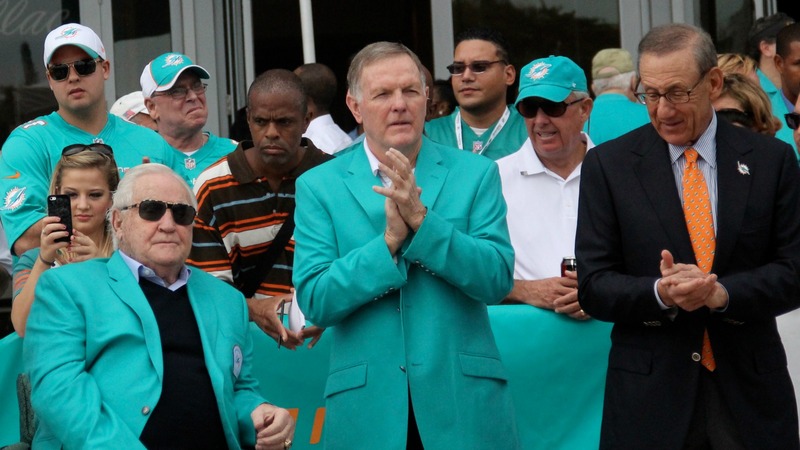 Other Miami legends in attendance included Hall of Famer Don Shula, the NFL’s all-time winningest coach. "They’re well-deserving," Shula said. "They’re guys that all made great contributions to the Dolphins. This is what it’s all about: recognizing contribution and making the fans aware of the fact that these players have to be remembered. Makes the players and coaches feel good." Shula also spoke about the current team, which entered Sunday a win and some help away from its first postseason berth since 2008. Fitting that all-time greats from the Dolphins family found themselves at Sun Life Stadium to watch arguably the biggest game in years against the rival Jets. "You see a lot of good things," Shula said. "The young quarterback (Ryan) Tannehill and the receiver (Mike Wallace) that can get deep. Defensively they’re pretty good. They’re very strong defensively." What impresses Shula the most about Tannehill is his prior experience as a wide receiver at Texas A&M, showcasing flashes of that athleticism on occasion. "You see that athletic ability when he’s outside the pocket, moving around, buying time and making guys miss," Shula said. "That’s a good trait to have when you’re a quarterback. He’s just going to keep getting better." Shula only had good things to say about the man leading the team, second-year head coach Joe Philbin. "I like him a lot," Shula said. "He’s a heck of a guy, comes from a good program, so he’s been with a winner. You can see the imprint in what’s happening here and the people he’s hiring and the way they’re playing. I think he’s the right man for the job." You can follow Christina De Nicola on Twitter @CDeNicola13 or email her at cdenicola13@gmail.com.